MySQL replication lets you to keep several databases synchronized and to use these databases simultaneously to improve your MySQL performance, security and other critical parameters. 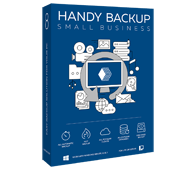 Handy Backup allows MySQL replication via the combination of backup and recovery actions. By using the only one strategy, you can back up MySQL or make a replication (either for cloning or for mirroring your tables). The unified, task-based method of MySQL server replication in Handy Backup allows you configuring any MySQL-related jobs with equal easiness. With the dedicated "MySQL" plug-in, you can easily set and tune any replication task for MySQL server data in Handy Backup. This program supports all parts of backup and recovery tasks for MySQL tables, including selecting storage, adding options and making a scheduled scheme. Handy Backup makes copies for MySQL database replication in a form of "dump" files, which contain all necessary MySQL commands to create an exact copy of an original MySQL table. You can easily modify these dump files, for example, to change a storage engine between MyISAM and InnoDB, and so on. The Small Business edition allows saving, restoring and synchronizing any types of server-level data, including making MySQL replication out of the box! To make a pair of tasks containing MySQL replication setup, please follow the short instruction (provided below), or read the User Manual sections about MySQL backup and recovery to learn some additional principles and tricks. Configure the MySQL Master and Slave servers, select storage engines etc. Make a MySQL backup task by using the "MySQL" plug-in, as described in the User Manual. Change (automatically by script or manually) all necessary parameters in MySQL dump files. Make a MySQL restore task to a different MySQL server according to the User Manual. An advice: You can schedule both backup and recovery tasks to make a MySQL replication process fully automated. In addition, you can write a script or a batch to modify dump file parameters between backup and recovery, and force this script to run after a backup task (set it up on the Step 7). The following video will teach you how to make MySQL backup and recovery – the two necessary parts of MySQL database replication procedure in Handy Backup. By learning this generic concept of MySQL copying methods, you will easily invent any MySQL replication scheme of any complexity! Where to Save Your MySQL Database Replication? Hard drives (including external USB disks). Shared network drives and NAS/SAN units. FTP, SFTP and FTPS servers. 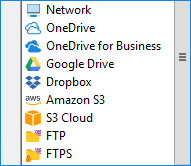 Clouds (including S3-driven clouds, Google Drive, OneDrive and OneDrive for Business, Dropbox etc.). Any of these storage methods allow some grade of data protection for your MySQL replication data. You can protect your tables additionally by encrypting the table content with internal Handy Backup tool. These are some other MySQL replication software solutions, including scripts and the phpmyadmin utility. Generally, these other methods lack the unification and easiness of MySQL replication with Handy Backup. Try Handy Backup as your MySQL replication software! Download now a free 30-day trial version with all plug-ins and functions ready to use!